The following is a photographic record of several crystal layouts, or body layouts as I refer to them. In the four case histories presented, you will see that the front layouts are quite different from one another. The layout patterns unfold intuitively, though for people starting out, following chakra charts is most effective. Click Here for an article on using intuition. Click Here for an article on explaining chakras complete with chart and crystal guide. In my experience, the back layouts are often similar to one another. I feel this is because I tend to treat the physical body (which I find is pretty much standard for everyone, on a cellular level) through back layouts, whereas the front ones are of a more spiritual nature, thus very individual layouts occur through the front. I would like to emphasize that this is merely my way of doing things. 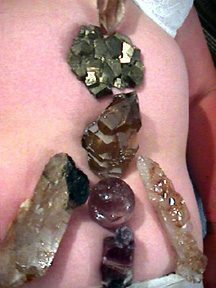 You may see or feel your own way of working with crystals and body layouts. With this in mind, please do not feel you need to use crystals as large as the ones I use. Any size crystal will be of help. One small crystal per chakra will make a big difference! You may enhance a smaller crystal’s strength by visualizing or willing/using intent to expand the energy past its normal boundaries. Lodestone has been used by many cultures for magnetic healing (they can quite happily pick up metal pins and nails). Below I have placed the lodestones in a triangle shape to represent a pyramid. Herkimer Diamonds (Small double-terminated clear quartz crystals from Herkimer, New York) to amplify and enhance the layout. 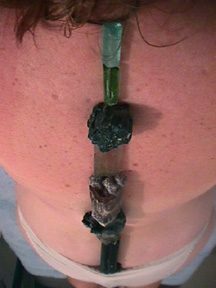 It is often helpful to place quartz crystals at the nape of the neck as well as the tailbone (spinal fluid reservoirs) during back layouts. 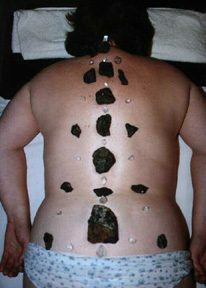 I have witnessed clients’ spines moving into balance quite often using Lodestones! It is interesting to note that sports medicine uses magnets for healing injuries to athletes, and Native Americans and Australian Aborigines have been using lodestone for many generations. Tourmalines are electromagnetic crystals. As we are electromagnetic beings we respond to these crystals very well. Tourmalines also come in all colors of the rainbow and are the only crystal to do so. Therefore I use a lot of creative visualization using the rich, diverse colors tourmalines have to offer. The tourmalines shown below are (from the bottom up), black, black tourmanated elestial quartz crystal, green tourmanated self-healed cathedral quartz crystal, green, rubelite (red/purple), pink, watermelon (round green with pink in middle), gem-quality green, and indocolite (blue). The tourmalines charge the body much like a battery charger charges batteries — the body rests while being charged up! As a result they are very good to sleep with. I recommend black for insomniacs (black tourmalines are an intense mixture of all the colors). 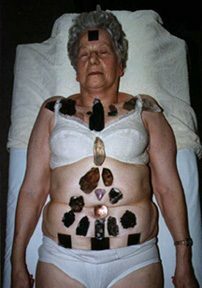 Elestial crystals are Master healers. They work on so many profound levels that I can not even begin to cover them all here! I believe if you are lucky enough to be a custodian of an Elestial, it will be a unique experience for the individual working with it. You may receive one or any of the following attributes — emotional guidance, moving from procrastination into intense action, spiritual guidance, calmness, energizing, profound insight, amplification of psychic abilities, detoxification of vital organs, healing on a physical level, and much more! 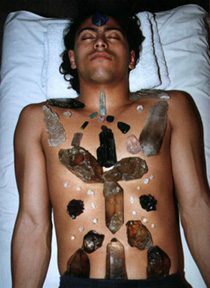 Being a healer who works with spirit and crystal energy, a crystal layout is one of the most beneficial healings I can have. 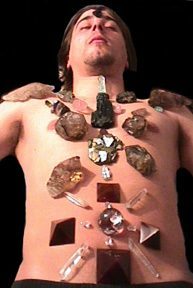 Anthony has the ability to pick up from one’s body as to what is needed, and from the crystals, which ones are best able to help. So help is given for actual ailments within the body, and for chakra clearings and energy blockages. Monday night’s layout came after several weeks of pressure in one area of my life, gradually causing a general tenseness. The first group of crystals (Lodestones) were pulsating very quickly after being placed in position. This doesn’t always happen, so I was pleased to feel the crystals get to work so quickly. The vibrations from them seemed to energize every cell, and this feeling was especially enhanced when energized with the digeredoo (an Aboriginal wind instrument used to ground higher vibration of crystals into the body physical). After the healing I felt very much at peace, as if I had been given a new start. I was able to think with more clarity, and felt balanced within myself. Several days later, I still felt very balanced. Before was anxious to get on with it :); basically had a bad day and it (the layout) was to be my highlight. Was incredibly strong. Had mostly mental chatter for the duration; however, was totally aware of the energy being cleared throughout my body, especially when the Elestials were laid down my spine and the Laser (long thin Quartz crystal) was used to send energy through them. Main area of blockage is my lungs and throat. As comfortable as my hip would allow (client had hip disease in childhood) I managed to settle more in this position than I did with the back layout. I was under the impression that a layer of armor was lying on my body once the layout was completed, and when looking at the layout through a mirror I was surprised to find my suspicions correct. A HUGE amount of energy went pouring through after a block was removed from my heart and throat chakras. The pyramidal crystal I had on my third eye (Ametrine) soaked up most of the backwash and was quite hot for a while. The crystals in my hands would heat up every time Anthony passed by them. I felt incredibly calm, relaxed, excited, and balanced. The next three days were relatively the same. I noticed more and more of my childhood memories returning, as well as a strong sense of the land in my home town. I have been feeling more connected to my body and have improved inner vision. I’m also experiencing a lot of short sharp realizations about life. My body has been feeling energized, with a sense of something more to come. ON THE TABLE: I arrived feeling drained of energy and felt physically sore. Once on the table I encountered intense mood swings, From calm to agitated, as that night was to be my debut at one of the city’s premier night spots as a DJ. AFTER: I felt calm and collected with no fatigue. The soreness was not noticed any longer. Later that night, as a DJ, I had an abundance of free flowing thought. The night passed very quickly due to the increased energy I had. This was surprising as I’d only had four hours’ sleep the night before and it was now 3am! After another short sleep I had to drive 180 miles to visit relatives. It went well with no aches or pains noticed afterwards. ARRIVING: I felt bloody awful when I arrived as I had been fighting a lung infection for weeks. ON THE TABLE: Once on the table I felt calm, relaxed, and could feel the energy working on the parts that needed work. AFTER THE LAYOUT: I felt very calm and noticed my thinking was clearer. I also felt lighter and was more settled during the evening. My breathing had become easier. The crystals have accelerated my recovery from the lung infection and was far more effective than the antibiotics I had been prescribed .The following day was a calming, energy gathering day and Monday I had a lot more energy. Gladys’ past crystal layout experiences and progress. A friend introduced me to Anthony and crystals. I had a terrible back pain that had bedridden me for 6 months. The doctors had informed me I was too old to have a spinal fusion operation and I was to be bedridden for the rest of my days. A friend took me to Anthony’s place for a crystal layout. That night my back felt very sore and I was quite worried about it. The next day, however, it felt a lot better. I went for layouts once a week and by the second week I was in the garden! Two and a half weeks later I had more mobility. After a while I flew down the country to see my friend. I had regained my life again, thanks to the crystals. I had a number of other ailments that were also healed — arthritis, varicose veins (I’d had those for 60 years! )and a frozen arm. Things were looking up, but life has a habit of throwing challenges in your path and I was thrown a big one. It had been discovered I had an aneurysm of the main artery just below my solar plexus and it was at life-threatening point. Two days before the operation I had a crystal layout (Anthony’s note: layout was different from any I’d seen. I felt it was to energize the cells to handle loss of blood and to move internal organs in preparation for the operation). After the operation a nurse who had observed it mentioned the surgeon had been surprised that everything appeared to have been laid out for him and they needed no drains. I was told before the operation it would be four weeks of recovery in the hospital, but I was out in one week! And I would also be interested in those classes and tutorials of course! Hi Ivy, We have just loaded the video editing software to make a start on those! Now we just need to find the time to shoot some footage! Hi Anthony!! Happy new 2016 and lots of blessings to you. Your website is the nicest website in the whole Internet. 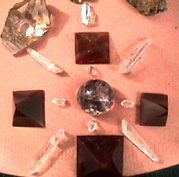 I would LIKE to ask you if you offer an E book or online classes to learn how to apply the layouts with crystals. Hi Olga, Happy New Year to you and may it be filled with bountiful bright blessings! At present I do not offer any E-books or online classes, though I do have video tutorials planned. I'm just waiting for the right time to make them. If you subscribe to this thread, I will post in here when the first batch are ready and the site will notify you! My friend Paul has been telling me I should look into interactive webinars, so maybe we can offer classes in real time in the future – food for thought so thank you for that!